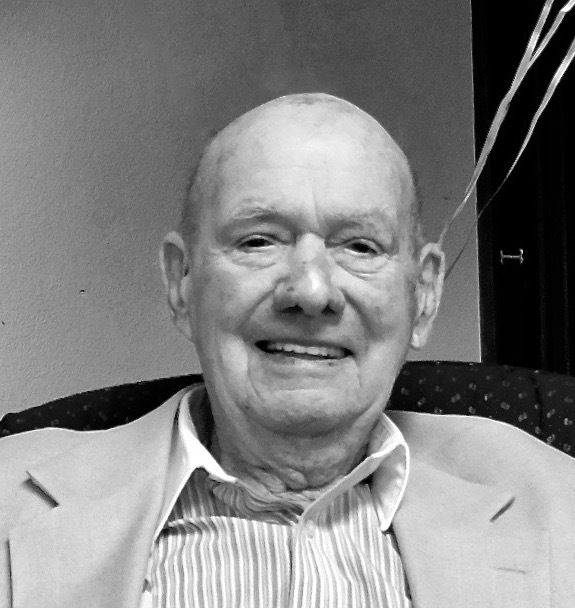 Joseph Eugene “Gene” Hopkins passed away on April 8, 2019, in St George, Utah, having celebrated his 101st birthday in January. He was born Jan. 29, 1918, to Wilfred Bernard Hopkins and Theresa Mary Keenan in Swift Current, Saskatchuwan, Canada. He married Mary Michela Ponza of Soquel in Capitola, California, June 29, 1940. Gene’s occupations were as varied as his ingenuity: ranch hand, baker, soldier, painter, contractor, fisherman, real estate developer, missionary and most importantly husband, father, grandfather and great-grandfather extraordinaire. With the outbreak of WWII, Gene’s cooking skills were put to good use as a mess sergeant in the 648th Tank Destroyer Battalion, XII Corps, 3rd Army. Under blackout conditions and with limited resources, Staff Sgt. Hopkins delivered hot meals to soldiers on the frontlines of battle in the European theater, earning the Bronze Star. Upon completion of his service in WWII, Gene returned to his wife Mary, daughter Jeanne and their home in Redwood City, California. Following the births of their two sons, Joe and Jon, Gene and Mary pioneered the hills above Soquel, California. They established a ranch (complete with Gene’s trademark swimming pool), and created a home where all were welcome. It was there that Gene and Mary joined The Church of Jesus Christ of Latter-day Saints. Gene spent decades as a counselor in a Bishopric, Bishop or as a Branch President. Many sought his counsel on spiritual and temporal matters. Accompanied by his charming, undaunted wife, Gene led a life filled with adventures in service: addressing welfare needs on remote islands in the Philippines, creating micro-loan projects for the impoverished, taking grandchildren to Hawaii and providing those around him (whether at home or in obscure corners of the world) with a steady supply of homemade donuts. Gene’s determination and independence enabled him to live and to serve his fellow man for over a century. In fact, as he approached his 101st birthday, he was able to renew his driver’s license, which allowed him to continue serving in the temple and reading to the infirm. He will be missed by many, both near and far. He is survived by his three children: Jeanne (David Macdonald) of St George, Utah, Joe E (Sophia) of Fruitland, Idaho, and Jon E (Andria) of Roseburg, Oregon. His grandchildren number 18 and his great-grandchildren 69. He is survived by his sister Mary Hopkins Messenger of Lincoln, California. He was preceded in death by his four brothers who probably wondered which of them would be last to leave mortality – he was in the middle. A memorial will be held Saturday, April 20, at the Fort Pierce Chapel in North Bloomington Hills at 1 p.m. Military honors will be provided by American Legion Post 90. Interment will be held in Santa Cruz, California. In lieu of flowers please donate to missionary endeavors. His family thanks many at care centers and emergency personnel for their kind services. Arrangements and memorial tree planting by Serenity Funeral Home, 435-986-2085. Family and friends are invited to share tributes at Serenity Funeral Home online.